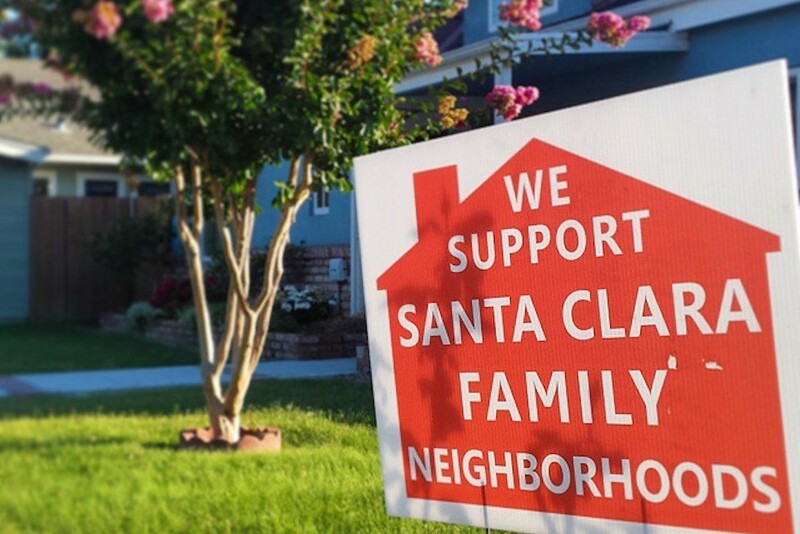 In 2014, homeowners in Santa Clara, California advocated for a city ordinance to prevent single family homes from converting into multifamily units, which are often rented to college students seeking affordable housing. Courtesy of Richard Masoner/Flickr. The expressed desire to defend community character is a staple of California conversations about development or other changes in neighborhoods. It’s a phrase routinely aimed at developers, planners, or anyone with a big, transformational vision. It’s also official writ in many cities, with places as different as Davis, Menifee, and Los Angeles committing themselves in plans to preserving their community’s character. In a state that is struggling to keep up with fundamental changes in housing, the economy, and the environment, there may be no more damaging set of words. The phrase is powerful precisely because of its imprecision. Vague enough to be wrong in so many ways, it is the ultimate dodge, practically meaningless, the NIMBY equivalent of “yadda, yadda, yadda” from the famous Seinfeld episode. But, in another sense, the phrase can mean everything to almost everybody. It’s a way to express any number of opinions, including: We don’t want this new general plan, this new development, these new immigrants. “Protect the character of our community” is used by poor people protesting development and gentrification that might bring richer people to their neighborhoods, and it’s used by rich people worried that affordable housing, transit, or homeless services might bring poorer people to their neighborhoods. It’s been used to throttle projects that would add to traffic and pollution by promoting sprawl and driving. It’s also been used to oppose development that seeks to reduce traffic and pollution by promoting density and transit. The defense of community character is a lousy argument in normal times, because neither character nor community is static. Housing, buildings, streets, economies, and public spaces all age, and all must be maintained, updated, and renewed. People don’t stay the same, sitting in one place—they have children, change jobs, learn new things, relocate, and, most of all, they age. And in so doing, they change the character of their communities, because what they need from their surroundings—both physical and social—changes. No healthy human community can stay the same; the best places become adept at managing change, and improving steadily. Indeed, the very promise of the California Dream was that our communities would incorporate vastly different people from around the country and the world, and transform into larger, richer, and more diverse places in the process. In our current times, which are anything but normal, the “protect-community-character” argument verges on treason to California and its ideals. California faces two huge categories of challenges. The first is to catch up on meeting residents’ existing needs, and the second is to reshape the state to meet future challenges. “Protect the character of the community” thinking is a big reason why neither group of challenges has been addressed. California has a massive infrastructure deficit—totaling an estimated $800 billion in unmet needs. It’s a consequence of decades-worth of homeowners and existing businesses saying: “Why can’t you do this some other place, because we want to protect the character of our community?” And faltering infrastructure isn’t even the most serious consequence of prioritizing the status quo over human needs. Housing is controlled at the local government level, where “the character of the community” argument is strongest. The results have meant disaster for the state. California housing costs two-and-a-half times the national average, and the state has the country’s longest and unhealthiest commutes, as people only find affordable housing too far from their jobs. Our failure to build sufficient housing, in the face of the community character argument, also forces more Californians to live in older, decaying housing. As bad as today’s housing crisis is, it pales in comparison to the potential dangers to California’s future presented by the community protection racket. The threat of climate change, in particular, will require transformation in how we live, which by definition will change community character. The design of our homes will change, so that they might run on renewables and keep us cooler in hotter times. Communities may be need to be relocated away from rising seas and out of fire and earthquake danger. And the state needs to invest massively in new transportation infrastructure so that we drive less and burn fewer fossil fuels. No responsible community in California should stay the same in such a time. It’s time for that era to end. But that will require that we stop singing the praises of community character and start realizing that it’s really the anthem of California’s religion of obstruction. It won’t be an easy shift to make. In their never-ending efforts to block progress, the character protectors have way too many tools at their disposal—zoning, design and environmental reviews that last eons; the California Environmental Quality Act; slow-moving licensing processes; and endless litigation in our budget-starved courts. The worst obstruction takes place close to our job centers, where there is the greatest potential for growth and for new, denser housing. The dark political genius of the “protecting the character of the community” argument is that it allows those who employ it to avoid responsibility for their obstructionism. They portray themselves as “stakeholders” merely trying to keep their neighborhood from getting hurt. Even worse, at a time that celebrates activism, many of these community-character protectors pose as righteous neighborhood activists. Please. They are the powerful, not the powerless. They’re victimizers, not victims. And they’ve been getting away with the crime of shutting their communities off from change, and putting big problems onto the younger, poorer, more diverse generations of Californians. It’s no accident that younger residents have been leaving the state in such high numbers; more than two-thirds of people who departed California in the past decade had annual incomes of less than $50,000. This New Year’s, it’s time for Californians who care about the future, the environment, and our neighbors to banish this noxious phrase from our vocabulary. And when we hear others use the phrase, we should point out what it really means: I got mine, and who cares about anyone else?